Today while cycling to work, the place where I carry out honest toil, a rather strange thing took place. I will elaborate. Arriving at a set of traffic lights I got myself ready for the green. Normally, I simple glide off at a fairly even pace and could generally say that I amble like a true English gentleman on a bicycle. To my right, up pulled another male on a bike. 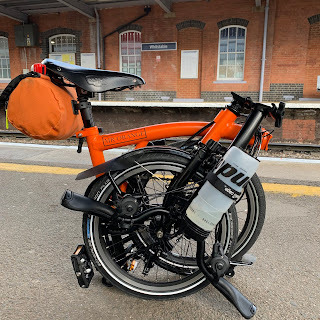 Not a Brompton, but one of those arse up head down jobs. He too was getting ready for the green. In a moment of madness, I decided that he would not beat me. He would not overtake! He would not pass!! The green lights fired and I was off. Having smaller wheels it was inevitable that I would accelerate at a tremendous speed. It is a matter of physics...surely. I surged ahead and stayed ahead for ages. Turning to face my rival I could see that I was indeed well ahead as I came up to another set of lights. Red lights. The other bike rolled up to my right yet again. This time I could see in his eyes that he didn't want that to happen again. My pulse racing I got ready of the green light. It came and I was off again and again I had out accelerated him. Knowing that a rather steep hill approached I moved the gears to whatever the gear is that gets one uphill. This caused my feet to turn the peddles like that witch riding her bicycle in the wizard of Oz - know the one I mean? Losing traction I could see my rival looming closer. As he passed me, as I knew he would surely do, I said, "morning" and continued to turn the wheels rapidly, which became a blur. I cannot explain this startling display and I suspect I would not do it again. Has this ever happened to you?If so share your experiences. I would sleep better knowing that I wasn't alone!